Donald J. Trump will hold a rally at the Southeastern Livestock Pavilion. Villagers Denise Neal and Beverly Johnson attended the Trump rally in Ocala. Villagers traveled to the Southern Livestock Pavilion in Ocala on Wednesday to show their support for presidential candidate Donald Trump. More than one attendee had set up a mock jail cell with Hillary Clinton figures inside which made popular photo stops. Many people also took pictures next to the campaign bus. 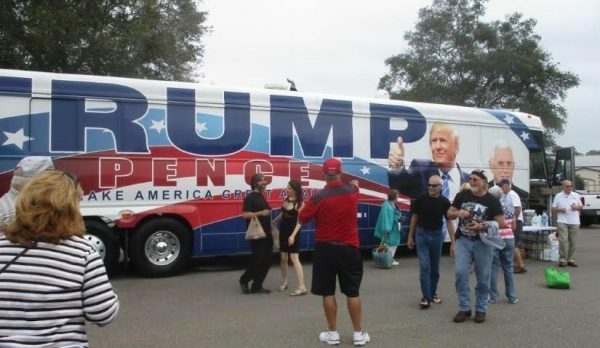 Donald Trump’s campaign bus at the rally Wednesday in Ocala. Some Villagers worked as volunteers at the event. Trump took the stage at the jam-packed Pavilion a little after 1 p.m. He was more than an hour late and anticipation was brimming over. Trump commented on the large crowd asking the media cameras to pan the crowd. “I always ask, but they never do,” he said. Trump had plenty of negative comments about the media peppered throughout his talk. He said that Hillary Clinton would be nothing without a cooperative media. Villagers Laura and Phil Rizzo and Joan Runyon attended the Trump rally in Ocala. Several topics drew huge cheers from the crowd. Opposition to Common Core, hiring a special prosecutor to investigate his Democratic rival, and building a wall along the Mexican border were easy crowd pleasers. He proclaimed that his time has come. “Enough is enough. This is the year; it is time to end the Clinton corruption,” Trump said.